Windy Days Ahead! Consider SureNail Technology! What's SureNail® Technology You Ask? Great Question! There's a line between a good shingle and a great roofing shingle. As a recognized Owens Corning Platinum Preferred Roofing Contractor I can tell you simply it’s the nailing line on your shingles. 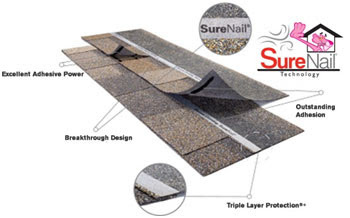 The difference between a good shingle and a great shingle is having SureNail® Technology. With SureNail® Technology, strength and durability are built into every Duration® Series shingle, thanks to the unique fabric strip in the nailing area. This unique shingle design provides outstanding gripping power. Call 4 Guys And A Roof If you want to learn more about the advantages of the SureNail roofing advantage today at 419-343-8648 or check out our website at www.4GuysAndARoof.com!